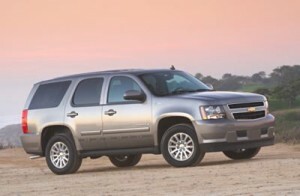 Best large MPG SUVs with 3rd row available today include the following three hybrid models – all from General Motors. Each delivers an EPA-estimated 21 mpg city/22 mpg highway. GMC Yukon Hybrid – With standard seating for eight in three rows, the 2010 GMC Yukon Hybrid, whose corporate siblings are the Chevrolet Tahoe Hybrid and Cadillac Escalade Hybrid, stands out in its own right. Yukon Hybrid is powered by a 332-hp 6.0-liter V8 paired with two electric motors. Edmunds comments: “A few years ago, the idea of a full-size traditional truck-based SUV averaging 21 mpg seemed about as likely as a Chevy Aveo blowing away a Corvette in the quarter-mile. Normally, you’d be hard-pressed to get 14 mpg in one of these over-5000-pound beasts. Getting an amazing 50 percent better fuel economy without giving up a powerful V8, 8-passenger capacity and the ability to tow 6,000 pounds might qualify that rig as the eighth wonder of the world. That rig is the 2009 GMC Yukon Hybrid.” Note: the 2010 model is the same, and certainly qualifies as a contender as one of the Best Large MPG SUVs with 3rd Row.